Internal radiation, on the other hand, emanates from radioactive elements which enter the body by inhalation, ingestion, or skin absorption. Hazardous radionuclides such as iodine-131, caesium 137, and other isotopes currently being released in the sea and air around Fukushima bio-concentrate at each step of various food chains (for example into algae, crustaceans, small fish, bigger fish, then humans; or soil, grass, cow’s meat and milk, then humans). After they enter the body, these elements – called internal emitters – migrate to specific organs such as the thyroid, liver, bone, and brain, where they continuously irradiate small volumes of cells with high doses of alpha, beta and/or gamma radiation, and over many years, can induce uncontrolled cell replication – that is, cancer. Further, many of the nuclides remain radioactive in the environment for generations, and ultimately will cause increased incidences of cancer and genetic diseases over time. 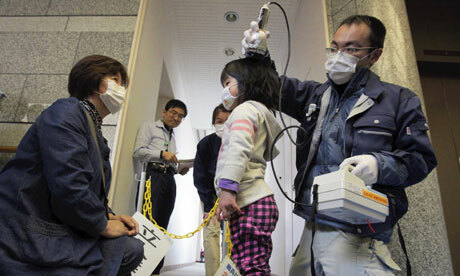 The grave effects of internal emitters are of the most profound concern at Fukushima. It is inaccurate and misleading to use the term “acceptable levels of external radiation” in assessing internal radiation exposures. To do so, as Monbiot has done, is to propagate inaccuracies and to mislead the public worldwide (not to mention other journalists) who are seeking the truth about radiation’s hazards. 2) Nuclear industry proponents often assert that low doses of radiation (eg below 100mSV) produce no ill effects and are therefore safe. But , as the US National Academy of Sciences BEIR VII report has concluded, no dose of radiation is safe, however small, including background radiation; exposure is cumulative and adds to an individual’s risk of developing cancer. 3) Now let’s turn to Chernobyl. Various seemingly reputable groups have issued differing reports on the morbidity and mortalities resulting from the 1986 radiation catastrophe. The World Health Organisation (WHO) in 2005 issued a report attributing only 43 human deaths directly to the Chernobyl disaster and estimating an additional 4,000 fatal cancers. In contrast, the 2009 report, “Chernobyl: Consequences of the Catastrophe for People and the Environment”, published by the New York Academy of Sciences, comes to a very different conclusion. The three scientist authors – Alexey V Yablokov, Vassily B. Nesterenko, and Alexey V Nesterenko – provide in its pages a translated synthesis and compilation of hundreds of scientific articles on the effects of the Chernobyl disaster that have appeared in Slavic language publications over the past 20 years. They estimate the number of deaths attributable to the Chernobyl meltdown at about 980,000. 4) Monbiot expresses surprise that a UN-affiliated body such as WHO might be under the influence of the nuclear power industry, causing its reporting on nuclear power matters to be biased. And yet that is precisely the case. See, for example, WJ Schull, Effects of Atomic Radiation: A Half-Century of Studies from Hiroshima and Nagasaki (New York: Wiley-Lis, 1995) and DE Thompson, K Mabuchi, E Ron, M Soda, M Tokunaga, S Ochikubo, S Sugimoto, T Ikeda, M Terasaki, S Izumi et al. “Cancer incidence in atomic bomb survivors, Part I: Solid tumors, 1958-1987” in Radiat Res 137:S17-S67 (1994).